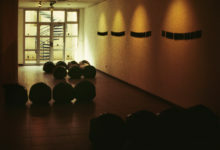 Nafas presents a group of seventeen black plastic bags that have been inflated with the artist’s breath. The seventeen bags are arranged on the floor of the exhibition space according to the following pattern: a first row with two bags, a second with four bags, four bags again in the third row that are slightly off-center from the others, three in a fourth row, and finally four in the fifth and final row. Visually, these plastic bags form parallel black bands, perpendicularly aligned in the direction of Mecca.